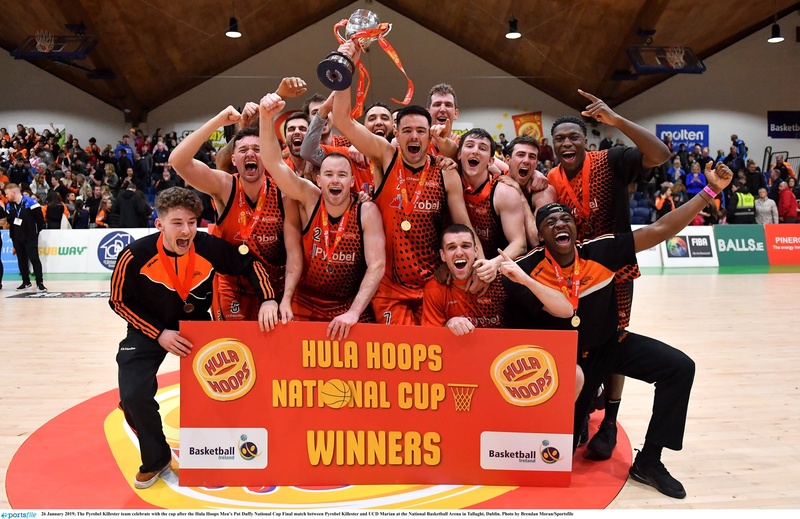 It was nine years coming, but it was certainly worth the wait as Pyrobel Killester ran out 66-63 point winners over UCD Marian in an absolutely thrilling Hula Hoops Pat Duffy National Cup final at the Arena in Tallaght this evening. 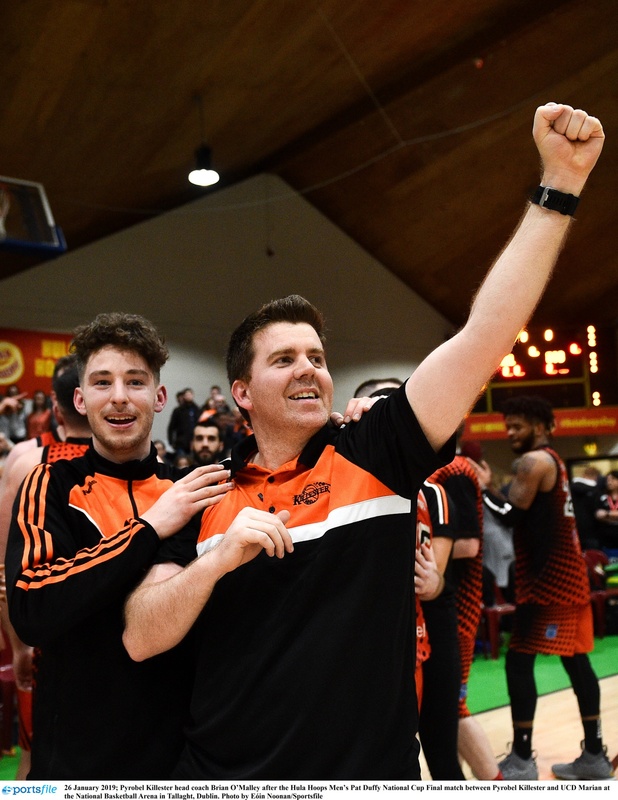 The game dished up everything you could want in a National Cup final and came right down to the very last second of the game as Kieran O’Brien claimed a vital rebound and knocked in the final basket. Momentum swung from side to side in the second, third and fourth quarters with UCD taking control after half time to build a nine-point lead. “They’re a really good defensive team and they bogged us down in the third quarter,” said Killester head coach Brian O’Malley afterwards – and that they did, but a 12-0 run hauled his side back into contention down the stretch with the help of a dogged Ciaran Roe. A huge three-pointer from American Royce Williams sent Killester in front by one point to ensure an absolute nail-biting finish. 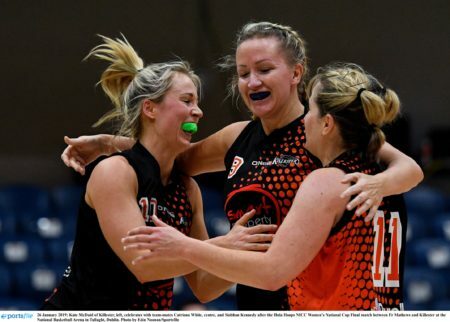 Indeed it was a double whammy of wins for Pyrobel Killester as their women’s NICC team scooped the Hula Hoops National Cup earlier today in style, with a masterclass from MVP Kate McDaid seeing them home to a 56-39 point win. The women in orange certainly avenged last year’s defeat in style, with a massive double double from McDaid (18 points/17 rebound) coupled with huge performances from Catriona White and Lauren Devitt saw them home to a memorable victory (full report attached). Tradehouse Central Ballincollig are back-to-back Hula Hoops Presidents Cup champions after they produced a stunning second half display to see out a 71-59 point win over Bad Bobs Tolka Rovers. 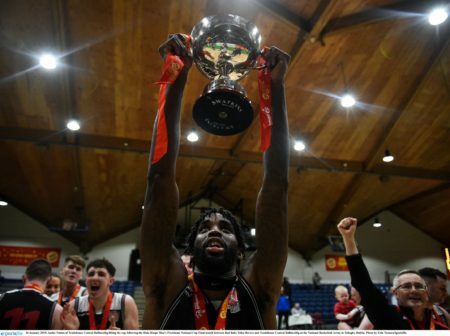 An MVP performance from Ian McLoughlin, coupled with the style and experience of Ciaran O’Sullivan, huge boards and stop from Andre Nation and the exciting young talent of Dylan Corkery Ballincollig were deserving winners in the end. A superb job at the other end of the floor from Justin Goldsborough, Alex Dolenko and Oisin O’Reilly kept the game nip-and-tuck the whole way through to the end of the third quarter, but a huge drive early on from Ballincollig in the fourth swung momentum in their favour to drive home to victory. The Hula Hoops U18 Women’s decider lived up to, and indeed, exceeded all expectations in the opening game of the day, as Liffey Celtics pipped WIT Wildcats in thrilling fashion, 66-64. A nail-biting affair saw Abby Flynn dazzling for Wildcats, leading the charge with a superb 28 point display, while at the other end, it was Ciara Bracken and Katie Williamson who inspired their team on along with a huge performance under the boards down the stretch by Fatimah Akorede.